Foreword. Preface. List of abbreviations. List of contributors. Microbial degradation of nitrogenous xenobiotics of environmental concern (V. Andreoni, G. Baggi, S. Bernasconi). Synthesis and degradation of dimethyl nitrosamine in the natural environment and in humans (T. Yoshinari). Aflatoxin biotransformations: biodetoxification aspects (V.P. Singh). Metabolism and cometabolism of halogenated C-1 and C-2 hydrocarbons (M.K. Jain, C.S. Criddle). Aerobic biodegradation of polycyclic and halogenated aromatic compounds (E. Grund, A. Schmitz, J. Fiedler, K.-H. Gartemann). Microbial degradation of halogenated aromatics (M.A. Bhat, C.S. Vaidyanathan). Microbial degradation of azo dyes (J.A. Bumpus). Microbial degradation of natural rubber (A. Tsuchii). Microbial degradation of polyesters (K. Mukai, Y. Doi). Degradation of Hazardous organic compounds by rhizosphere microbial communities (T.A. Anderson, D.C. White, B.T. Walton). Microbial degradation of styrene (S. Hartmans). Microbial degradation of vinyl chloride (S. Hartmans). Isolation and characterization of neurotoxin-degrading gene (I.M. Santha, S.L. Mehta). Microbial degradation of tannins (R.K. Saxena, P. Sharmila, V.P. Singh). Index. A comprehensive and consolidated account of how microorganisms can play a significant role in degrading and detoxifying toxic, carcinogenic, mutagenic, and teratogenic compounds is detailed in this book. Moreover, the volume deals with all aspects of microbial degradation, ranging from screening methods for the degradative microorganisms, processes of degradation, strain improvement for enhanced biodegradation, and elimination of undesirable compounds to improving health and environmental protection strategies. 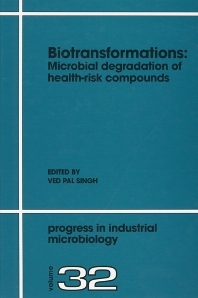 The book will provide an opportunity for scientists in the areas of microbiology, biochemistry, engineering, food science, biotechnology, and environmental science to obtain a clear understanding of microbial biotransformations of xenobiotics, as well as an interface between industry and the academic world. The first book of its kind, it will open new vistas of research in the field of Applied Microbiology and Biotechnology in general, and Biotransformations in particular.